A well coated and long lasting sheen make my dishes look more appetizing. Knorr Rock Sugar Honey Sauce consistently delivers superior coating with a long lasting sheen. Cooked from yellow rock sugar & real honey. Best used in coating! All food additives used are from plant and synthetic origins. May contain traces of cereals containing gluten, eggs, milk, peanut and tree nuts. *25% lower in sodium as compared to regular sauces. 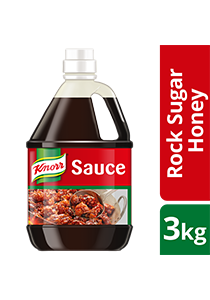 Knorr Rock Sugar Honey Sauce is a premium honey sauce specially designed for coating deep fried foods. Cooked from yellow rock sugar and honey, it gives food a perfect coating and an inviting sheen. Despite its thick consistency, it has a light aromatic sweetness. With this versatile base sauce, you can now create a variety of sauces without starting from scratch! 1. Heat 120g of Knorr Rock Sugar Honey Sauce in wok and add in fried chicken. 2. Cook over low heat and toss till sauce is caramelised and evenly coated over chicken. Store in a cool and dry place. Refrigerate at 4-10°C after opening and do not freeze.